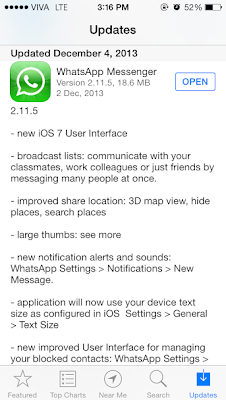 Whatsapp just released a new version of its app with a major makeover and some new features. The new iOS app update brings the much anticipated iOS 7 inspired visual refresh to the app. The App icon is flat, and the internal is a total match to iOS7 theme. - New iOS 7 user interface. - Improved share location: 3D map view, hide places, search places. - Application will now use your device text size as configured in iOS Settings > General > Text Size. 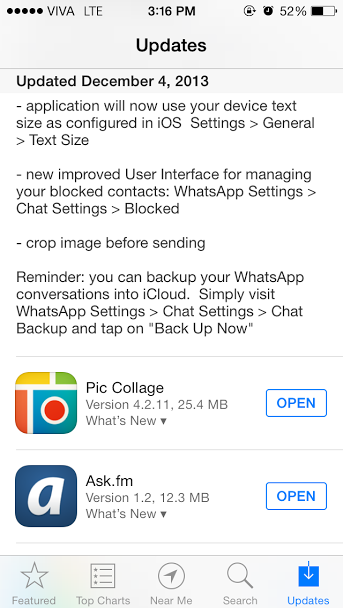 - New improved User Interface for managing your blocked contacts: Whatsapp Settings > Chat Settings > Blocked. And the same previous option where you can backup your conversations into iCloud. 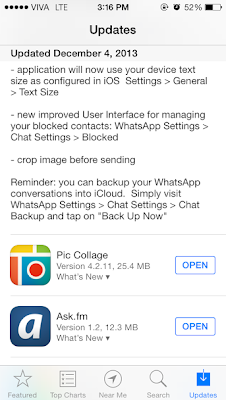 By simply visiting Whatsapp Settings > Chat Settings > Chat Backup and tap on "Back Up Now."